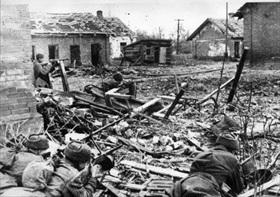 By one German count, over five million Red Army sol­diers had been taken pri­soner since Adolf Hitler unleashed Opera­tion Bar­ba­rossa, the inva­sion of the Soviet Union begun 16 months ear­lier. As for the num­ber of Soviet ser­vice per­son­nel killed and dis­abled, there was only a rough esti­mate, but clearly the Red Army had suf­fered near incom­pre­hen­sible losses. Still, from the point of view of the Ger­man High Com­mand, the Soviets were not defeated and were some­how con­tinuing to resist. 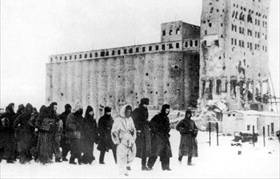 Indeed, on this date in 1942, five Soviet armies stood fixed in deep win­ter snow and ice between Stalin­grad (present-day Volgo­grad), an indus­trial city that stretched 16 miles along the west bank of the Volga River, and two Ger­man armies, the Sixth and Fourth Panzer. The Wehr­macht had over­come the pre­vious winter’s crisis when it failed to take Mos­cow, the Soviet capi­tal, and now the Ger­man armed forces on land and in the skies seemed ready again to defeat and anni­hi­late dozens of Soviet divi­sions. 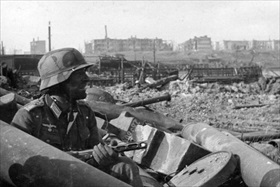 After their first armored groups had reached Stalin­grad’s sub­urbs at the end of June, the Ger­mans appeared on the brink of cap­turing their first major Soviet city, which Soviet dicta­tor Joseph Stalin had vowed to defend to the last man. Hitler appeared to be mes­meri­zed by the city that bore the name of his rival. 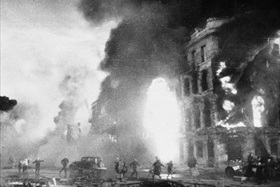 Departing from the policy of Blitz­krieg, Hitler com­mitted his armies to one of attri­tion. The deci­sion proved to be disas­trous for Gen. Fried­rich Paulus’ Sixth Army and for Ger­many itself, in part because the Ger­man armed forces, for the second time in two years, were poorly pre­pared for a win­ter cam­paign. On Novem­ber 19, 1942, the Red Army launched Oper­a­tion Uranus, part of the on­going Battle of Stalin­grad (Septem­ber 14, 1942 to Febru­ary 2, 1943). 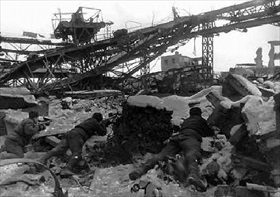 The next day a second Soviet offen­sive kicked off south of Stalin­grad, and by Novem­ber 23 Soviet armies closed the ring around the city. Ger­man strength inside the ring was about 210,000. In the 11 weeks following this double envelop­ment, 105,000 sur­ren­dered; 35,000 escaped by air; 60,000 died, com­mitted sui­cide, or were un­able to sur­ren­der when the end came; and roughly 10,000 men remained to fight on until exter­mi­nated (end of February). After Stalin­grad the stra­tegic advantage on the Eastern Front shifted to the Soviets, never to change. Left: A massive German strategic bombing raid on August 23, 1942, caused a fire­storm, killing thou­sands of Stalin­grad resi­dents and turning the city into a vast land­scape of rubble and burned-out ruins. 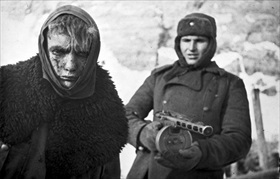 Left: A Red Army soldier marches a German sol­dier into capti­vity. A hand­ful of cap­tured senior Ger­man offi­cers was taken to Mos­cow and used for propa­ganda pur­poses, and some of them joined the National Com­mit­tee for a Free Ger­many (NKFD), a Ger­man anti-Nazi organi­za­tion that operated in the Soviet Union during the war. Some higher-ups, among them Paulus, whom Hitler had made Field Marshal hours before the Ger­man sur­render, joined the NKFD and signed anti-Hitler state­ments that were broad­cast to Ger­man troops. Paulus testi­fied for the prose­cu­tion during the post­war Nurem­berg Trials. He remained in the Soviet Union until 1952, then moved to Dres­den in Com­mu­nist East Ger­many, where he died in 1957, exactly 14 years after surrendering the German Sixth Army. Right: German troops as prisoners of war, 1943. In the back­ground is the heavily fought-over Stalin­grad grain ele­va­tor. Out of the nearly 110,000 Ger­man pri­soners cap­tured in Stalin­grad, only about 6,000 ever returned. Already weak­ened by dis­ease, star­va­tion, and lack of medi­cal care during their en­circle­ment, they were sent on death marches (75,000 died within 3 months of cap­ture) to POW camps and later to labor camps all over the Soviet Union. Some 35,000 were even­tu­ally sent on trans­ports, of which 17,000 did not sur­vive. Most POWs died of wounds, dis­ease (par­tic­u­larly typhus), cold, over­work, mis­treat­ment, and mal­nu­trition.